For the second time in the 15-year tenure of Ferris State University President David Eisler, faculty members have approved a resolution of “No Confidence” in the FSU leader for his administration’s poor handling of contract negotiations which has led to a faculty strike and ongoing turmoil at the university. The MEA-affiliated faculty union resoundingly approved the resolution in balloting conducted Sept. 25-26, with nearly 90 percent of participating members voting in favor. According to Ferris Faculty Association (FFA) President Charles Bacon, the vote marked the first time in FSU history that a single president has earned two no-confidence votes. Of 270 ballots cast in the FFA’s no-confidence vote, 239 (88.5 percent) voted yes and 31 voted no. Nearly three-quarters of FFA members participated in the voting. The first no-confidence vote on Eisler occurred in 2007. Bargaining was scheduled to continue on Friday, Oct. 12. The 450 tenure-track faculty members at FSU have been working without a contract since June 30. A one-day walkout on the first day of fall classes Aug. 28 has been followed by informational picketing on campus and at university events, along with sit-ins at Eisler’s office. Meanwhile, a recent FSU graduate has started an online petition in support of the faculty. Beth Sweney, who was named FSU’s Outstanding Graduate in Biology in 2016, has garnered nearly 600 signatures in 11 days with her detailed appeal to Eisler to “cease battle” against the FFA. Sweney lives in Big Rapids and is now pursuing a Master’s degree in Physician Assistant Studies at Grand Valley State University. 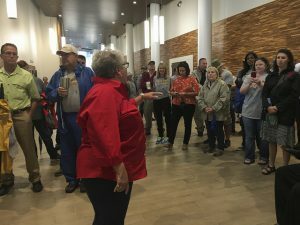 She said she wanted to give students, alumni, community members, and other supporters of FSU the chance to weigh in on the issues, so faculty members know how much they are respected, valued, and admired. 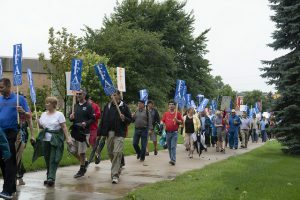 Nearly 300 faculty members picketed on the first day of the fall semester in protest of the university administration’s refusal to bargain in good faith. The faculty contract expired June 30, but the administration would not meet for talks in May or June. As striking faculty walked a picket line and handed out flyers to students, university officials filed a legal complaint against the association. A circuit court judge issued a temporary restraining order requiring faculty members to return to work the next day. Faculty leaders continued informational picketing and held sit-ins outside Eisler’s office to pressure administrators to return to the bargaining table with renewed commitment to negotiate a fair contract. Talks were scheduled to resume in early October. The August strike garnered widespread media attention. Longtime physics professor Dr. Bo Lou, who stood with dozens of colleagues along busy State Street on the edge of the Big Rapids campus at the start of the semester, said the problems boil down to a lack of respect and fairness. “The upper administration is getting a very high rate of increases,” Lou said. University President David Eisler’s compensation has grown by 128 percent since 2001. During that same time period, faculty wages have increased 44 percent. The FFA is seeking a 2.75 percent increase, down from 6 percent originally. However, the university has not budged from its offer of a 1.5 percent increase, which amounts to a pay cut for many faculty when combined with continuing health care cost increases – a proposal Biology Professor Chris DeFraia considers insufficient. Bacon said bloated administrative costs reflect the university’s failure to prioritize employees. He points to research in the past few years that shows higher education spending on faculty has declined since 2000, at the same time administrative spending has increased. Meanwhile, FSU faculty are among the lowest paid professors at public universities in Michigan, he noted. The university has again retained the same law firm it used in the last round of negotiations. That firm billed FSU more than $400,000 for its work in 2013. In addition, the university recently hired a public relations firm at significant cost. 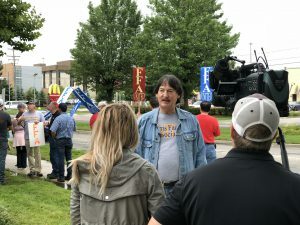 “It bothers me a lot that the university team hasn’t budged on anything, and yet they’ll bring in an outside negotiator from Ann Arbor and pay him $500 an hour to drive back and forth,” said 33-year veteran English professor John Cullen. “They have lawyers on staff who are competent professionals. They could negotiate this. A number of students expressed their support for the striking faculty’s demands. Junior Rebecca Bostic stopped by the picket line with friends to share words of encouragement. 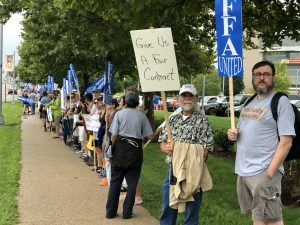 The FFA recently filed Unfair Labor Practice charges with the Michigan Employment Relations Commission against the university. The charges detail the university’s refusal to bargain in good faith, as well as bullying and intimidation tactics the university has engaged in. Specifically, college administrators directed employees to conduct video surveillance of faculty members to identify those participating in informational picketing in the days leading up to a strike vote held in the end of August. 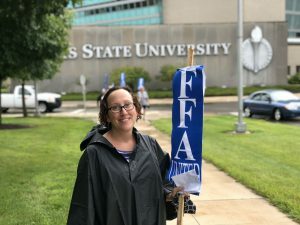 Check out photos from Ferris State on August 28.
work at EMU, then come talk to me about unfair labor practices and low wages………..
I’m sorry but faculty told us students in May that classes wouldn’t start on time but not to worry. They knew then that they were striking and preparing for battle.